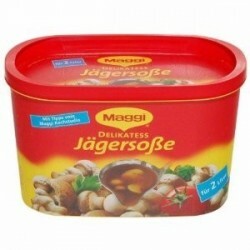 Fix Products There are 104 products. 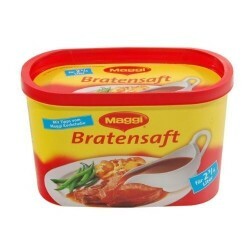 Sauces for Sauerbraten and other German dinner. 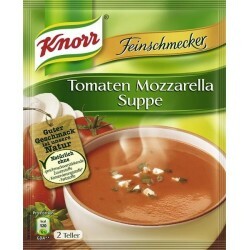 Knorr ®Feinschmecker Tomaten Mozzarella SuppeGourmet Tomato Mozzarella Soup- without taste-strengthening additives- without colorings - no preservatives (according to law)Makes 0,5 liter / 2 servingsSee preparation instructions below. 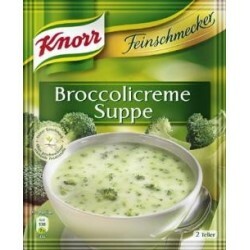 Knorr ®Feinschmecker Broccolicreme SuppeGourmet Broccoli Cream Soup- without taste-strengthening additives- without colorings - no preservatives (according to law) - vegetarian Makes 0,5 liter / 2 servingsSee preparation instructions below. 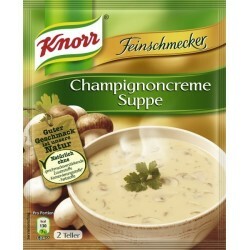 Knorr ®Feinschmecker Champignoncreme SuppeGourmet Champignon Sream Soup- without taste-strengthening additives- without colorings - no preservatives (according to law)Makes 0,5 liter / 2 servingsSee preparation instructions below. 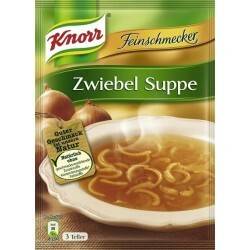 Knorr ®Feinschmecker Zwiebel SuppeGourmet Onion Soup- without taste-strengthening additives- without colorings - no preservatives (according to law)Makes 0,75 liter / 3 servingsSee preparation instructions below. 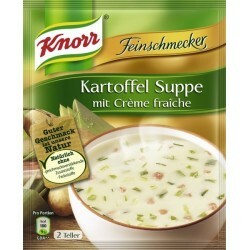 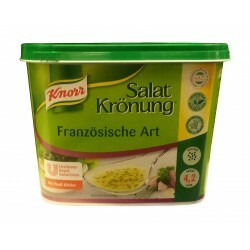 Knorr ®Feinschmecker Kartoffel Suppe mit Creme fraicheGourmet Potato Soup with Creme fraiche- without taste-strengthening additives- without colorings Makes 0,5 liter / 2 servingsSee preparation instructions below. 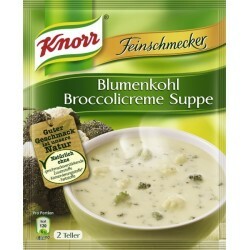 Knorr ®Feinschmecker Blumenkohl Broccolicreme SuppeGourmet Cauliflower Broccoli Cream Soup- without taste-strengthening additives- without colorings - no preservatives (according to law)Makes 0,5 liter / 2 servingsSee preparation instructions below. 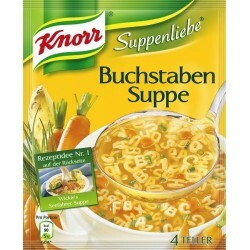 Knorr ®Suppenliebe BuchstabensuppeSoup Love - Letter Soup- without colorings - no preservatives (according to law)Makes 1.0 liter / 4 servingsSee preparation instructions below. 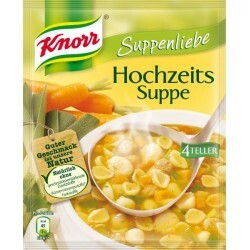 Knorr ®Suppenliebe HochzeitssuppeSoup Love - "Wedding Soup" - without taste-strengthening additives- without colorings - no preservatives (according to law)Makes 1.0 liter / 4 servingsSee preparation instructions below. 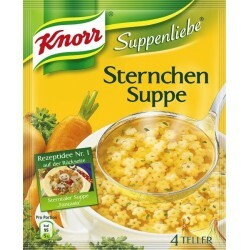 Knorr ®Suppenliebe SternchensuppeSoup Love - "Asterisk Soup"- without colorings - no preservatives (according to law)Makes 1.0 liter / 4 servingsSee preparation instructions below. 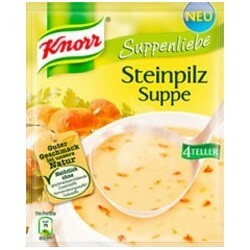 Knorr ®Suppenliebe SteinpilzsuppeSoup Love - Boletus Soup - without taste-strengthening additives- without colorings - no preservatives (according to law)Makes 4 servingsSee preparation instructions below. 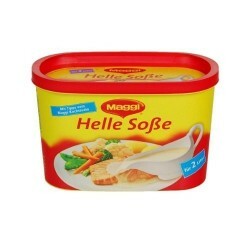 MaggiFix & Frisch Helle Sosse / White Gravy Cooking like in GermanyInstantNo flavour enhancers or preservatives added.Makes 2 Liter No flavour enhancers or preservatives added. 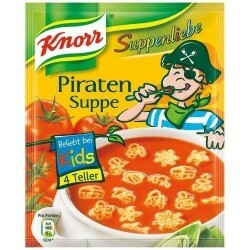 Knorr ®Suppenliebe Piraten SuppeSoup Love - "Pirates Soup"- without colorings - no preservatives (according to law)Tomate soup with motive noodles.Makes 1.0 liter / 4 servingsSee preparation instructions below. 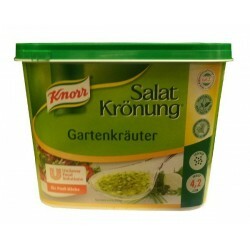 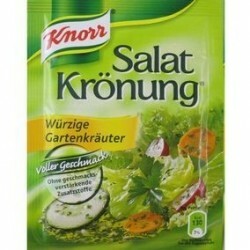 Knorr Salat Krönung®würzige Gartenkräuter (Spicy Garden Herbs)1 Pack / 5 Bags (total ca. 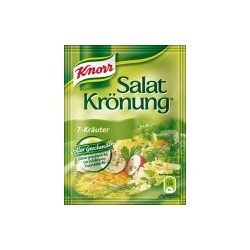 60g)Cooking like in GermanyMake a delicious salad dressing in seconds.